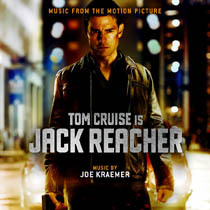 La-La Land Records and Paramount Pictures present the release of composer Joe Kraemer's (THE WAY OF THE GUN, AN UNREASONABLE MAN) original motion picture score to Paramount Pictures' acclaimed thriller JACK REACHER, starring Tom Cruise, Rosamund Pike, Richard Jenkins and Werner Herzog, and directed by Christopher McQuarrie. Kraemer fashions a crackerjack corker of a score, infusing it with an unmistakable 70s vibe that results in a sound that is as knowingly retro as it is freshly contemporary - the perfect compliment to this taught, wildly entertaining mystery/action/thriller cocktail. Produced by Joe Kraemer and mastered by Bruce Botnick, this special CD release features an exclusive Bonus Track that is not available for digital download. Film music writer Tim Greiving provides liner notes, with additional notes from the composer and writer/director. (Note: This is not a limited edition release). 5/5 I love Joe Kraemer... been doing some great edgy and driven scores over the years, this one is no different! I still need to get out to this film, but with Arnold's next movie coming out this weekend, not sure I'll get to see it.